The hotly-contested nature of EOS decentralization and governance remains at the forefront of blockchain community discussion. The recent inaction of an EOS block producer — resulting in the loss of 3,570 EOS, or about $27,500 — brought the EOS governance model under harsh scrutiny over the past week, as industry experts and observers debate whether EOS can be defined as a “decentralized” cryptocurrency. The EOS project, which can be likened to a hybridized blockchain system where property rights are enforced via community sentiment, relies on 21 block producers that operate the network. These block producers are voted in by the EOS community and rewarded with EOS tokens. Block producers contribute to a three-party system that composes the EOS governance architecture. EOS token holders are the second element of the EOS ecosystem, while the EOS Core Arbitration Forum (ECAF) function as arbitrators – whose role within the EOS ecosystem created a significant amount of controversy since the EOS mainnet launch. 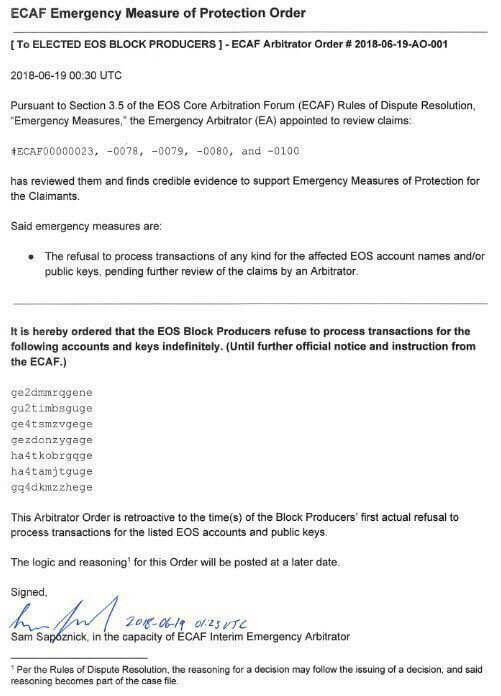 The ECAF as an arbitration body within the EOS ecosystem is able to make decisions regarding EOS accounts deemed to be in violation of the EOS constitution. Recently, the EOS governance structure blacklisted a number of EOS accounts that were identified as associated with fraudulent activity. Blacklists are issued by ECAF and are delivered to block producer meetings. The reliance of the entire EOS ecosystem on these meetings is an apparent weak point in the $4 billion project, as a recent meeting that was missed by a critical block producer saw 3570 EOS lost in a governance failure. The execution of ECAF blacklist orders has created dissent within the cryptocurrency community, with several industry experts expressing the perspective that the EOS governance model is at odds with the libertarian ideal of distributed ledger technology. Those same groups have to be available 24×7 to run the network, so asking them to attend a meeting isn’t an unreasonable request. This is one of the joys of running infrastructure. Never claimed to be a crypto expert. I’ve run enough 24×7 platforms to understand the need for a team able to respond to issues. EOS in its current form requires that of its BPs. My point is an elected BP in a production network should have that capability. That’s a simple ask.